Drivers are still taking it slow around Fort Worth as they try to navigate icy roads, and parents say they hope the streets are better before school goes back into session. "There's a lot of concern out there, especially for a parent,"Anthony Aguilera said. Maria Rodriguez said she is concerned about a possibly dangerous morning commute when children are allowed to go back to school. "I just saw some people that were not taking precautions while they were driving, and I thought someone was going to hit me from behind," she said. 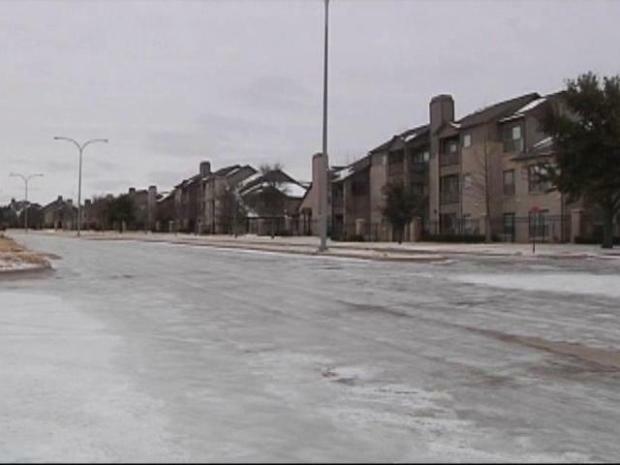 North Texas highways are mostly clear, but many residential streets are still ice rinks. Fort Worth's Transportation and Public Works Department said it has 22 trucks working 24/7 to treat bridges, inclines and high-traffic areas such as those around hospitals. Schools would be added to the list when they open it. But the department also said it simply doesn't have the resources to treat all of the side roads. Fort Worth schools are preparing to eventually reopen. The heat is on in all buildings to keep pipes from bursting. All the boilers are on to keep them from breaking, and schools are constantly salting sidewalks. Some North Texas cities are having a hard time treating the ice on side roads and streets. Clay Carrillo-Miranda said he won't risk taking his children to school if the side roads near his home aren't safer by the time school reopens. "If I'm staying home, my kids are staying home... If I don't feel safe working in it, I'm not going to put kids out there in it, either," he said.